Boris Yeltsin -who was president of the Russian Federation- was a volleyball player. Russia hosted the Boris Yeltsin Cup in 2008. The Japanese men's team won the gold medal at the Munich Olympics in 1972. Japan beat East Germany 3-1 in the final. This team also won the gold medal at the 1970 Asian Games in Bangkok (Thailand). The Olympic players were: Yoshihide Fukao, Kenji Kimura, Masayuki Minami, Jungo Morita, Yuzo Nakamura, Katsutoshi Nekoda, Tetsuo Nishimoto, Yasuhiro Noguchi, Seijo Oko, Tetsuo Sato, Kenji Shimaoka, Todayoshi Yokota. The FIVB (Federation Internationale de Volleyball) is one of the most successful sports organizations in the world. Dr. Ruben Acosta (president of the FIVB) said, "There are no secret to success. Just organization, administration and management, sharing know-how and skills, and seizing opportunities..."
In 1952, India was among 8 countries which took part in the First Women's World Championships in Moscow (USSR). 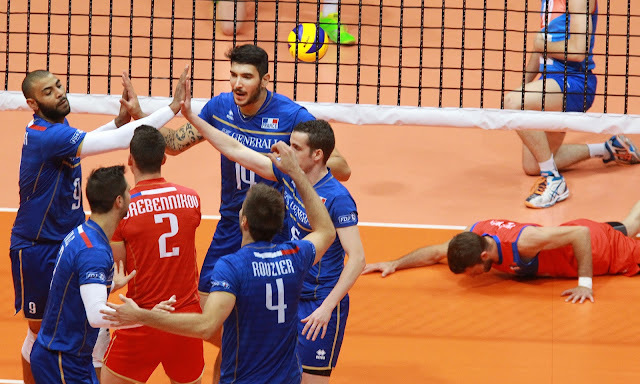 The United States men's volleyball squad finished 6th place in the Volleyball World League. The team members were: Marc Jones (played for SDSU), Parker Blackman (played for Stanford), Allen Allen (played for Hawaii ), Dan Greenbaum (played for USC ), Uvaldo Acosta (George Mason), Craig Buck (El Charro PD, Italy), Bryan Ivie (USC), Jose Gandara (UCSB), Tom Sorenson (Pepperdine), Eric Sato(SMCC), Brent Hilliard (CSULB), Jon Root (Stanford), Scott Fortune (Stanford), Carlos Briceño (Hawaii), Bob Samuelson (CSUN), Mark Arnold (Pepperdine), Mark Kerins (CSULB), Shirman Trevor (UCLA), Javier Gaspar (Penn Saint), Dan Hanan (Stanford).